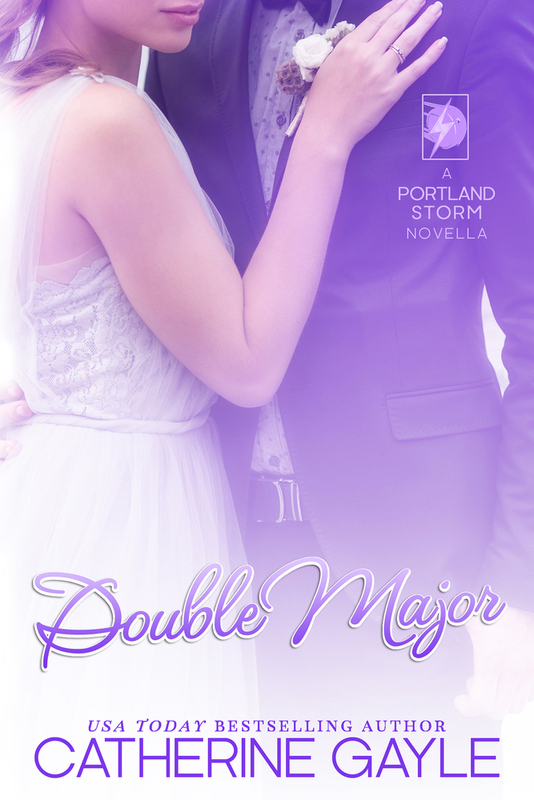 This is a novella of second epilogues to books 1-5 in the Portland Storm series. It is approximately 35,000 words long. I’d arrived early. It was an old habit, but one I doubted I’d break anytime soon. One of my first coaches had always told us that to be early is to be on time, to be on time is to be late, and to be late… Well, you’d just better not be. Now, a decade or more later, I couldn’t seem to make myself show up anywhere merely on time. Hardly anyone else was there yet for the rehearsal—no one I knew, anyway—so I plopped down on one of the seats up near the front, right by the altar, and pulled out my cell to scan the half a million texts I’d gotten in the last hour from Levi. Levi was my younger brother, the oldest after me. We had five more brothers younger than him, too. There were kind of a lot of us. And he’d been texting me like crazy all day because tomorrow was the National Hockey League’s Entry Draft, and he was expected to be picked in the top five. No matter what, he should definitely be the first defenseman taken in this year’s draft. Two years ago, I was in a similar spot. I was selected seventh overall by the Portland Storm, and I somehow made the team right out of training camp as an eighteen-year-old rookie. Because I had been in that same position and could coach him on what to expect, right now I felt like the shittiest brother in the world. Levi and the rest of our family—even our uncle and cousins—had all been with me when I’d been drafted. And they were all in New York with Levi right now, helping to keep him calm as he went through his meetings and media interviews and physical tests, and all of the other insanity that goes with being a top prospect. But where was I when I ought to be with him? I wasn’t in New York; I was in Providence, Rhode Island. Two of my teammates were getting married tomorrow. That made me a good teammate, I supposed, but not a very good brother. Team captain Eric Zellinger—Zee to the guys—and his childhood best friend, Brenden “Soupy” Campbell, were both tying the knot, and for some reason they’d asked me to be one of their groomsmen. I wasn’t sure why they’d chosen me and not one of the guys who had been around the team longer, like Ny or maybe Monty. I mean, yeah, I’d lived with both of them, but that didn’t make me groomsman material, did it? Either way, they hadn’t asked those guys; they’d asked me. I looked around the mostly empty chapel. At least being here early gave me time to respond to Levi’s texts. I spent a few minutes poring over them. He’d had a good meeting with Jim Sutter and the rest of the Storm’s executives at the draft, but Jim had already warned me countless times not to get my hopes up. He wasn’t slated to make a pick until number eighteen this year, and Levi would be long gone by that point. The only way Levi would be drafted by the Storm was if Jim somehow worked out a trade with another general manager and was able to move up. But he had told me again and again that it just wasn’t likely to happen. Which wasn’t news to me. Trading up would mean losing prospects, and they were a commodity he was trying to stock up on, not trade away. Since Levi knew he wasn’t likely to be chosen by the Storm, he had his sights set on the Toronto Maple Leafs. They were the team we’d always been fans of, my brothers and I, growing up in Ontario. They had the fifth pick this year, but Levi said his meeting with them hadn’t gone well at all so he didn’t have a good feeling about it. It went much better with the Montreal Canadiens, but they weren’t picking until number twelve. He felt pretty confident about his interviews with the Buffalo Sabres and the New York Islanders, too—both were slated to pick within the top five—so in all likelihood he’d be playing for one of those two teams. His best interview of the day, though—at least so far—was with the Winnipeg Jets. There was a small part of me that hoped the Jets would choose him. They were a Western Conference team, like Portland, and so Levi and I would get to play each other more often than if he were with some team in the Eastern Conference. They were slated to pick sixth, and everyone was saying that they were looking for defensemen in this draft, so there was a definite possibility there. Levi still had meetings scheduled with five other teams for later on in the day, so it was anyone’s guess where he would end up. I was just about to respond to his slew of messages when the door opened and about a dozen people came in—Zee and Soupy, their fiancées Dana and Rachel, and most of the others in the wedding party like Liam “Kally” Kallen and his girlfriend, Noelle Payne. I only had eyes for one of them, though—Katie Weber, the oldest daughter of my former teammate, David Weber. I’d had a thing for Katie for two solid years, ever since I first joined the Storm. These days, it was much more than that. I was half in love with her. I hadn’t seen her since I left Portland almost six weeks ago, and it took me by surprise to discover that she had some hair now. A few months back, she’d been diagnosed with leukemia. She’d had to go through radiation and chemotherapy and all that, so she’d lost her hair and wore scarves to cover her baldness most of the time. Or at least she did the last time I saw her. I knew she’d finished her chemo before we’d been knocked out of the playoffs, but I guess I hadn’t thought about the fact that her hair would be growing back already. It was short, like a pixie cut, and it looked soft to the touch. Thinking that only made me want to touch it, though, and that probably wasn’t the best idea with her dad standing right beside her. Webs caught my eye and inclined his head in my direction, but I still couldn’t ever determine what the looks he gave me meant. Hi? Come on over? Take one step in this direction and I’ll rip your balls off and stuff them down your throat? I couldn’t be sure. If his wife, Laura, had been paying attention, I might have been able to get a read on him from her, but she was caught up talking to Sara Thomas, our former head coach’s daughter. So Laura was no help to me right now. Webs had just retired as a player, and this season he was going to be one of the Storm’s assistant coaches. That should work out just great…as long I didn’t misinterpret any of the looks he gave me. The Storm made it all the way to Game Seven in the second round of the playoffs last season, but the LA Kings had gotten the best of us in the end. We couldn’t really hang our heads over that. Our team hadn’t been to the post-season at all in the previous five years, so getting to the second round was a lot further than anyone had expected us to go. Plus, the Kings went on to win the Stanley Cup, and we’d nearly taken them out in the second round. That was definitely nothing to be ashamed of. We were all hoping to take what we’d done last season and improve on it this coming year—and that meant making the most of the time off we had this summer. I’d gone home to my family pretty much as soon as I’d finished clearing out my stall. I think I slept for about a week straight once I got there, but then I’d gone back to life as usual. All my brothers played hockey, too, so we were all training together—some of us more seriously than others. But then again, Jack—the youngest—was only eight, and most of the boys really didn’t need to work out like Levi and I had to. It was still fun, us all being together like that. Especially since Levi and I had started using the youngest boys as our weights, bench pressing them, that sort of thing. Katie and her family had remained in Portland after the season ended because she and her younger brother and sister had to finish out the school year. Now she’d graduated, though, and she’d finished all of her cancer treatments. Webs had let us all know a few weeks ago that her latest tests showed she was cancer free. That meant she could move forward with her life. I just wasn’t certain if I was part of it. I’d taken her to her prom, and we’d spent some time together since then…but she had been sick and still in high school, and I had been in the middle of the playoffs for the first time in my career, so we hadn’t really been able to date. Not like I wanted to, at least. That hadn’t stopped me from sneaking her away from her dad to steal a few kisses every now and then. I hoped to be able to do more of that this weekend—and to find out what she had decided to do next year. Each time we’d talked about it before, she’d been too caught up in trying to get healthy to worry about whether she was going to go to LA to meet with an entertainment agent she’d talked to once about some ideas he had for getting her a career in Hollywood, or if she was going to stick around Portland and her family and maybe go to college, or something else. The selfish part of me wanted her to stay in Portland. The part that was already half in love with her wanted her to do whatever would make her happy, even if that meant her leaving. No matter which of those two voices decided to talk the loudest, I just wanted to know what she’d chosen. I slipped my phone back into my pocket and got up, and she immediately turned her head in my direction. Her whole face lit up when our gazes met. I could make out the sparkle in her eyes even across the distance, and Katie’s smile reeled me in like a fishing line; my feet started moving in her direction before my head could catch up. “Hey,” she said when I was almost to her. “It looks nice,” I repeated, feeling like an idiot. Her parents were in the middle of a conversation with Zee and Dana, so that meant Webs wasn’t giving me the evil eye anymore. I had just taken Katie’s hand and was about to pull her off to a corner somewhere so we could talk when Soupy’s dad whistled loudly. “I think we’re all here now, so why don’t we get started?” he said once all eyes turned to him. Before I could respond, she went over to her mother’s side, looking back at me over her shoulder and giving me a wink. I trudged over to join Keith Burns, Cam Johnson, and Webs—the other groomsmen—up near the altar so we could get things underway. That didn’t sound good at all. I definitely noticed he’d said we, though. Like we were in this together. The wedding coordinator started talking, telling us what each of us were supposed to do and how things were going to go down, not that I was paying any attention to him at all. Had Katie made up her mind to leave? Just then, my phone started buzzing in my pocket. It had to be more text messages from Levi. And they kept coming and coming. I wasn’t just a bad brother; I was the shittiest brother ever, hands down. Especially because I was more worried about what the cryptic warning Webs had given me meant than I was about the half million text messages from my brother.